I hate to tell you this, but I made exactly NO progress on my bathroom makeover up until yesterday! I’ve been sick with pneumonia for two weeks, and Wednesday evening was the first day I had the energy for any serious DIYing. But, I am pleased to say that my to-do list for the One Room Challenge is beginning to look a little less onerous. Since this post would look pretty sad and dejected without any images, I’ve rounded up some of the options for lighting. I’ll be honest and say that I’m pretty stumped for lighting right now. All these light fixtures have such totally disparate styles to them… And I’m a little lost. I’m also restricted by my $300 (total!) budget, of course. I’d really appreciate your thoughts. 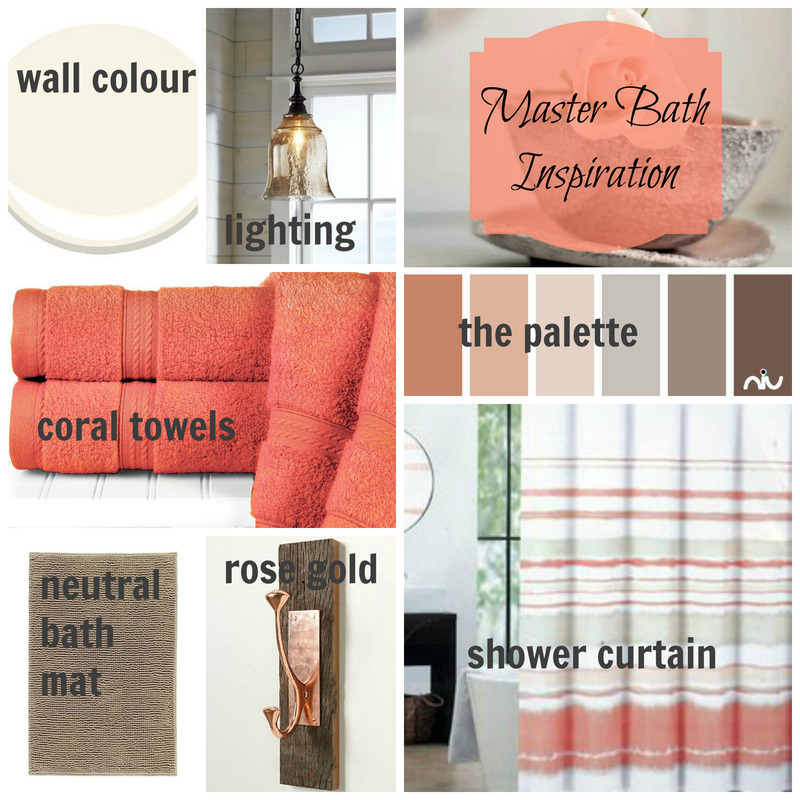 Here’s my initial inspiration board, to give you an idea of where I’m coming from. Oh! And thanks for all your helpful suggestions and comments regarding framing out the mirror! I really appreciate you weighing in on that. I think we’ll be going with simple white framing… Sort of a combination of Option 1 and 2, if you remember them from last week. Thanks so much for sticking with me. I hope that by next week’s ORC installment, I’ll have a handle on the direction for the styling of this bathroom. 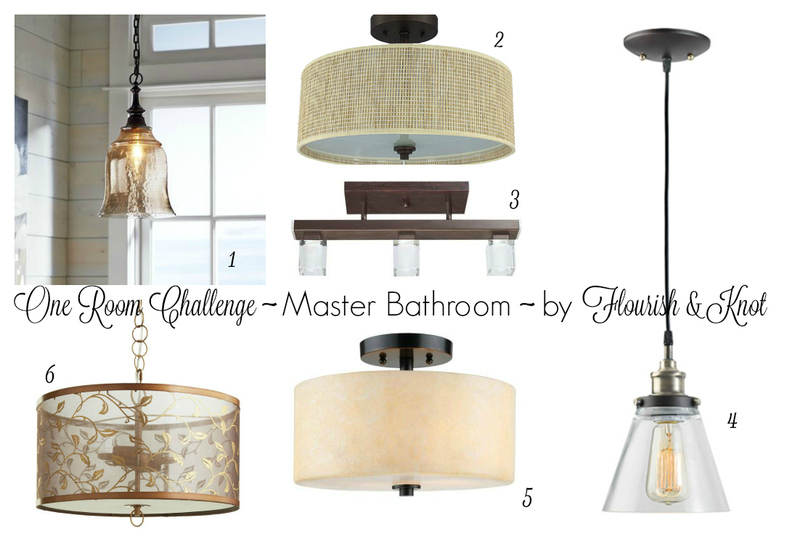 One Room Challenge | Week 4 | Vanity Fair? Sorry to hear that you have been sick. Even so, it looks like you are rounding the corner on your room. I’m contemplating lighting right now too. I love #4 the Rona pendant. But two of those is going to eat up almost half of your budget. I can’t wait to see it come together. Thank you! I like that one too, but budget is definitely an issue… And I only have one junction box, so I would only be able to use 1 light. We’ll see. I think #6. Light, a bit frivolous… I like 4, too, but I would bet that those trendy “Edison” lightbulbs are expensive! I think you need a “clear” shade for a bathroom, too…so that you can see yourself in the mirror when you are half asleep! Thanks – I’m concerned because it is a linen shade and the bathroom tends to be a pretty humid place… We’ll see. I love the lighting options 1 & 2. I have a large bathroom mirror that also needs framing, so I really can’t wait to see how you do that! Thanks, Roxanne! I appreciate your input. Glad you’re starting to feel better. Pneumonia is no joke! All your lighting options are great, but I think it’ll really depend on which style YOU like. My favorite is #1 and #4, and I see you have #1 on your vision board, but certainly other styles would work too. I know, all the decisions are so hard. I had people voting on mirrors during the last ORC. Thanks, Erin! I’m leaning toward #1 because of the gorgeous colour, but I’m worried that it won’t give enough light… I may shop around a bit this weekend. I am impressed by the energy you have after your bout with pneumonia. I won’t weigh in on the lighting, but am inspired by # 1 as we have two light fixtures to install in our LR and are not making great progress on it. We are also fixing up a small flat in TO, so your bathroom considerations are helpful – sorry I’m not. I’m sorry to hear you were so sick. Glad you’re on the mend. I like option #2 for its texture. I wanted to add that I also like #2 because it uses three 60 watt bulbs–it will really brighten your bathroom. Yes, I agree about the three bulb idea… I’m going to be shopping this week! I like #3 and 4 for the lighting options. I hope you feel better soon and excited to see more of the reveal next week. Loving the colors! Can’t wait to see this week’s post! Thanks so much! I’m working on it… Just trying to find the energy to get off the internet and start working! In love with your color palette!!! I really want to see it all together! It’s going to be great. Thanks for the vote of confidence, Stephanie!